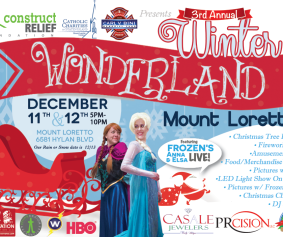 Join Construct Relief, Catholic Charities of Staten Island, and The Carl V. Bini Memorial Fund for our Third Annual Winter Wonderland at The Mount! 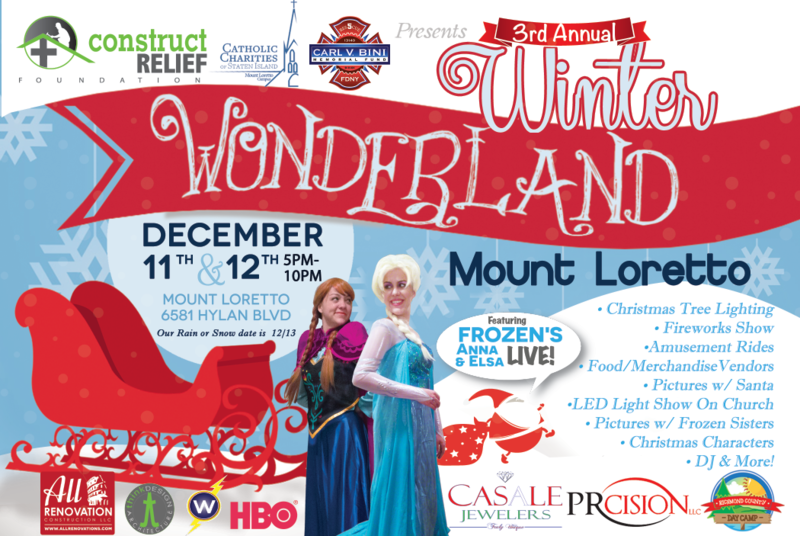 This FREE event will feature the unveiling of a new LED light show on the church’s facade, fireworks each night, food and merchandise vendors, rides for the kids, pictures with Santa, Christmas tree lighting, characters from the movie Frozen, DJ, and more! In addition, on Saturday December 12th at 10am we will also be hosting Staten Island’s First Santa Shuffle 5k where people of all ages can walk, run or dance their way through Mount Loretto’s campus donning a Santa Claus hat and beard. There is no admission charge for the Winter Wonderland Event and a cost of $35 per adult and $20 per child for anyone wishing to participate in our Santa Shuffle. Please scroll down to register for the shuffle online.